With its British shops, duty-free shopping, English-speaking locals and strong links to our military, many UK tourists are drawn to Gibraltar, confident they’ll be able to speak the local language and order a glass of wine! But this diminutive slice of Britain, just two-and-a-half square miles big, has a history that far outweighs its size. Gibraltar has been under British control since the 1700s, becoming a key base for the Royal Navy in the 1800s. Its war efforts were further strengthened in the Second World War, when its civilian population was evacuated to England, as well as Morocco, Madeira and Jamaica, and its lofty 426-metre-high Rock became a fortress. A decade later, Spain made an attempt to claim sovereignty, but Gibraltar managed to remain a British overseas territory. 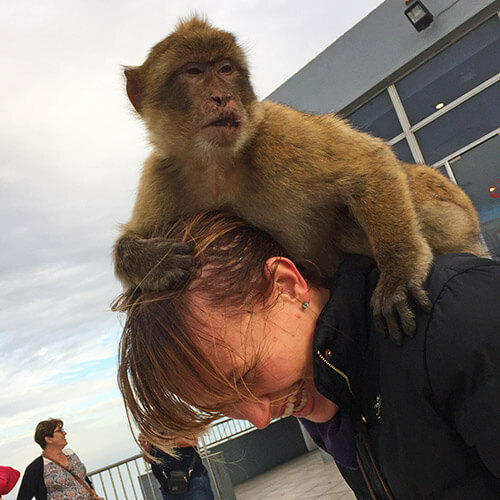 Now a popular tourist destination thanks to its Mediterranean climate, a vast swathe of Gibraltar Rock’s higher ground is a nature reserve, which is home to more than 230 Barbary macaques. Groups can take the Gibraltar Cable Car to the top of the rock and get off at Apes’ Den – but beware! The apes are well versed in the art of relieving holidaymakers of their packed lunches, handbags and cameras the moment they step off the cable car (as you can see from the pic…!). Due to its position, attached to Spain and staring across the Strait to North Africa, Gibraltar has been an important military fortress for centuries. As a result, a huge network of tunnels have been carved into the Rock – a mind-blowing 30 miles of tunnels to be exact – the last of which were built in the 1960s. Today, groups can explore this underground warren, with tours of the World War II tunnels available, where you can experience the soldiers’ subterranean existence and see where the allied invasion of North Africa was planned. A taste of Gibraltar’s earlier military action can be found in The Great Siege Tunnels, which were excavated during the Great Siege of the late 1700s. While its early history, circa the 1100s, is revealed at the Moorish Castle. The castle, tunnels and the famous St Michael’s Cave (a stunning natural grotto) can all be explored on a day trip to the upper rock nature reserve. If you’re on foot – quite painful due to the Rock’s steep inclines and steps! – you can pay a small fee to enter the reserve and then pay for each separate attraction as you come to it. Popular mini bus tours are also available, and are easier on the legs. Here, a guide will ferry you to the top of the Rock as you take in the sights and attractions en-route. You can catch a mini bus from any number of spots in town, and tour prices vary depending on how many attractions you’re going to be visiting, so get set to haggle. Gibraltar is home to more than 500 species of flowering plants, including the Gibraltar candytuft, which is a native of North Africa and not found in the wild in Europe anywhere but here. The Rock’s Barbary macaques are the only wild apes in Europe. The Bay of Gibraltar is home to dolphins and whales. The local currency is the British pound, though euros and Gibraltarian pounds are accepted (they’re not accepted back in the UK, however, so change your money back to UK sterling before you come home).